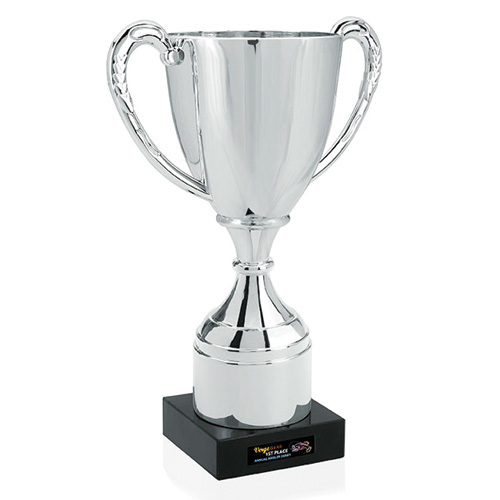 Classic Loving Cup - 8" Great for little leagues, this trophy is small and light. Perfect for motivating little ones. Here's a classically stylish way to recognize young champions!Our new, 8" Classic Loving Cup is great for Little Leagues. This trophy is small, light and perfect for motivating little ones. Measuring 5-5/8" W x 7-3/4" H x 3-1/8" Dia, this gleaming silver trophy sits on a marble base and features an ABS plastic cup, handles and stem. Free 24-hour service. Ideal for championship games. Celebrate victory by ordering now! 5-5/8"w x 7-3/4"h x 3-1/8"dia. Bulk / 11 lbs / 12 pcs. Acrylic Plaque - 8" x 10" x 3/8"